A Seax or Scramaseax is a dark age knife which has a single edge, a straight back and a clipped point. Examples of which range from a few inches a few feet long. They were used both as tools and as weapons thought the 3rd - 11th century. The larger ones are generally held to be weapons and items of some status. The longer seaxes tend to be embellished with non-ferrous overlay or constructed by pattern welding. Smaller ones tend to be plain iron and for domestic use. Blade shapes were in use which have been variously described as "Hogs Back", "Broken Backed" and "Cusped". I make small seax knives of 5" to 6" long to living history enthusiasts as functioning parts of their display and cookery kit. This enables them to own, use and talk about pattern welding in their interpretive displays for a minimal financial outlay, although most domestic small seaxs would be more likely to be plain unadorned iron. This is a 10th century seax. The blade is laminated wrought iron with a carbon steel edge hammer welded on and an ash wood handle. A plain but authenticly made piece. I hope you can agree with me that despite the lack of any embellishment on either blade (which is neither pattern welded or overlaid with coloured non ferrous metals) or handle this seax is a better choice for the authentic living historian than one made with a featureless plain carbon steel blade which has no grain. The blade is 10" long and overall it is 16" long. This is a small domestic seax with a 6" long blade and an antler and horn handle. The blade is pattern welded with a carbon steel edge. 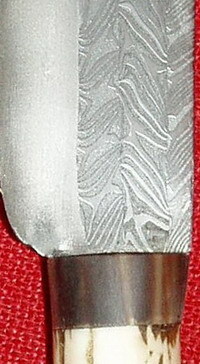 Pattern welded long seax (referred to by Oakeshott in archaeology of weapons as possibly relating to the term "skolm" used in the sagas). A few examples exist in Britain and Denmark. The pattern welding is a 2 core twist being flat forged into the blade and creating a herringbone ("ann" or mown corn pattern, rather than a wavy, swirly, possibly "blodida" or blood eddy pattern). The pattern welded band lies down from the back which is layered iron forming a rigid half inch thick tapering to quarter inch at point, spine to the blade. These weapons had a short period of existence from mid 9th to beginning of the 10th century. They were more economic in the use of good quality steel in their construction and easier to forge due to only having one cutting edge. They would have been a better choice to pierce a mail shirt or the thick linen hauberks used at the time than the sword, which was mainly a hacking weapon in this period. A pattern welded seax with a 7 1/2 inch blade and an antler handle. The blade is made with a two bundled herringbone core, a wrought iron back and carbon steel edge. The pattern welding is composed of two bundles twisted continously and each bundle has at least 80 layers giving a more subtle effect to the pattern.